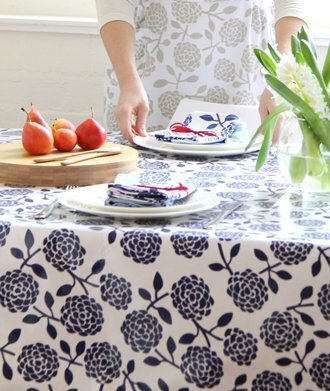 Our matte finish oilcloth is super smooth and non reflective, it looks just as good as fabric on the table. We coat our 100% cotton tablecloths with a layer of protective matte finish PVC for easy care cleaning and great entertaining. Perfect for outdoors, picnic tables and for the kids. Dandi is a Sydney based design studio specializing in the design and creation of beautiful textile patterns and innovative homewares. The duo behind Dandi are industrial designers that share a passion for style and interior trends and together they translate their design talents into stunning pieces for the home. Drawing inspiration from the natural environment, they create botanically-inspired prints and apply them to their specialized textile and homeware products. Dandi brings together the concept of the unique and commonplace, blending aesthetics to create understated yet elegant pieces with a distinctive and bold style. Welcome light, color and vibrancy to your home everyday with timeless homewares by Dandi. If you have any questions about this product by Dandi, contact us by completing and submitting the form below. If you are looking for a specif part number, please include it with your message. LA Linen Polyester Poplin Rectangular Tablecloth, Orange, 60" x 84"